Recent stages of the Mapping Cancer Markers (MCM) project have illuminated the protein-protein interactions and biological pathways involved in lung cancer, and have also suggested surprising results about its biomarkers. Once this current stage is complete, MCM will transition to analyzing ovarian cancer. Thanks to your help, we are making discoveries and helping the international research community. Dr. Jurisica, in particular, is one of the most frequently cited researchers worldwide. In our previous update, we announced a second, targeted stage of lung cancer signature discovery. We have since moved to a new, third stage in lung cancer analysis: targeting high-scoring, uncorrelated biomarkers. These different stages are all part of an overall effort to understand lung cancer signatures. The first stage surveyed possible lung cancer signatures drawn from the complete set of biomarkers in our lung cancer dataset. The statistics gathered in this first stage were used to narrow the list of biomarkers to explore in subsequent stages. The second and third stages explore lung cancer signatures drawn from small sets of high-performing signatures, chosen by two different methods. In the second stage, we focused on a 1% subset of biomarkers, selected by the frequency with which each appeared in high-scoring signatures from the initial stage. In the third stage, we selected a different subset of biomarkers that are both high-scoring and largely uncorrelated to one another. Correlation is a measure of information shared between two data sources. Two biomarkers are correlated if they exhibit similar patterns in the cancer dataset. For example, two correlated genes might show high activity in one set of tumour samples, low activity in a second set, and average activity in a third. Including two highly-correlated biomarkers in the same signature can reduce the quality of the signature, because they would be contributing redundant information to the signature. For a fixed-size signature, a redundant biomarker would potentially displace another biomarker that has different information content. As an analogy, consider the information contained in a small library of textbooks. Say there are three books, A, B, and C. If A and B are two copies of the same textbook, one of them is redundant. Removing B from the library would not change the information contained in the library, and replacing B with a different textbook (D), would increase the information in the library. If A and B were similar, but not identical books (e.g., two books on introduction to molecular biology written by different authors), there would still be some overlap in the texts, and a possible advantage to replacing B with D.
Because the target biomarkers in this third stage were selected to be minimally inter-correlated, every signature should be free of redundant information. We therefore hypothesized that signatures in the third stage would perform better on average than those in the second stage. Figure 1 shows the surprising results: second stage signatures (potentially containing correlated biomarkers) outperformed those from the third stage. We are analysing these results further, to determine the main reasons for the performance difference. Figure 1. 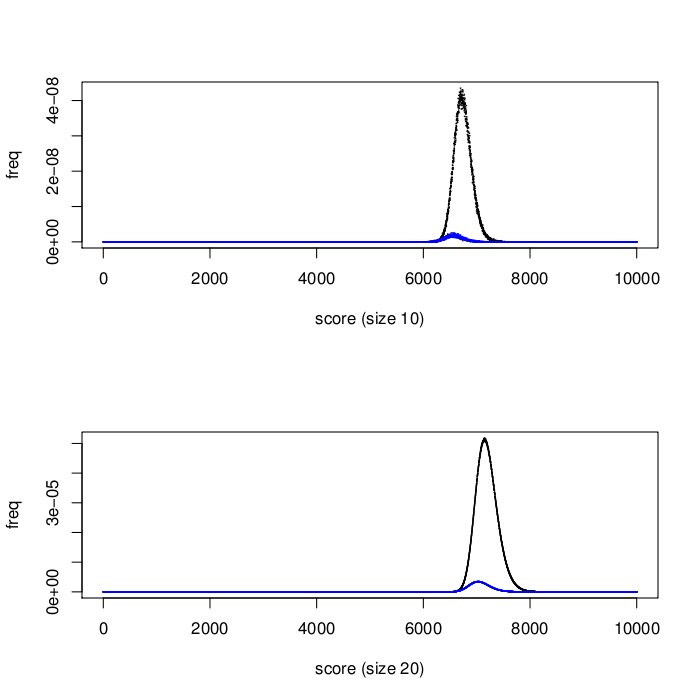 Distribution of signature scores for second (black) and third stage (blue) signatures. As expected, larger signatures generally outperform smaller. Surprisingly, second stage signatures outperform third stage on average. Larger signatures (i.e., signatures containing more biomarkers) incorporate more information and can potentially offer better accuracy, but are more complex and expensive to implement in the clinic. All three stages of MCM thus far have explored lung cancer signatures of multiple sizes. For each signature size we considered, the target biomarker subsets for the second stage were chosen separately, based on statistics from the first stage. The set of biomarkers selected for the third is fixed across all signature sizes. This fixed set allows us to compare the effects of signature size on each biomarker’s frequency in high-scoring signatures. Figure 2 shows the frequency change when moving from 10 biomarkers per signature to 20. Each dot in the graph represents a biomarker. The X axis represents the frequency with which biomarkers appear in size_10 signatures. The Y axis indicates frequency in size_20 signatures. Note that the biomarkers change in rank but are generally correlated. Size_10 signatures show greater biomarker frequency spread: some have relatively high frequency, and many are low-frequency. 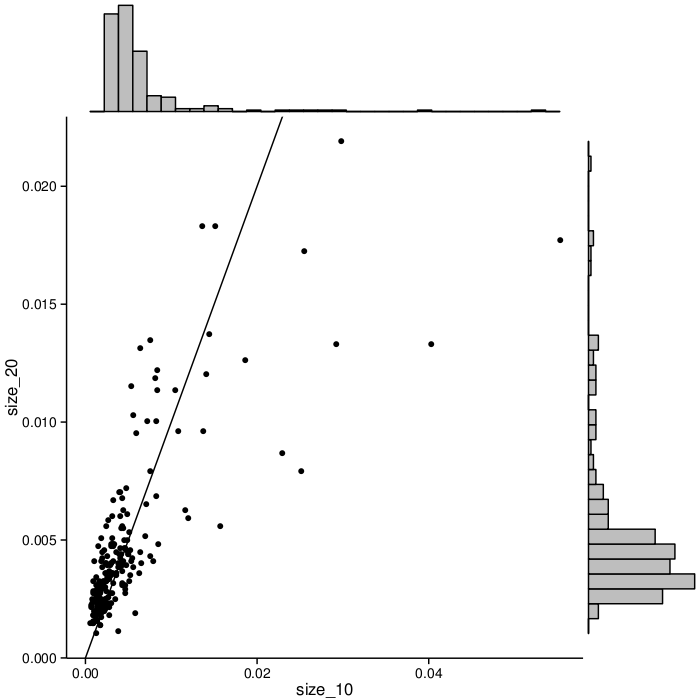 The biomarker frequencies in larger (size_20) signatures are more even. Biomarker pairs as protein interactions? We applied and extended the analysis of biomarker pairs described in the August 2015 update to early results from third stage data, looking specifically for pairs of biomarkers in both the second and third stages that appear surprisingly frequently in the highest-scoring lung cancer signatures. When two genes or proteins appear in signatures together with greater frequency than expected randomly, we predict a stronger cancer-related connection (interaction). 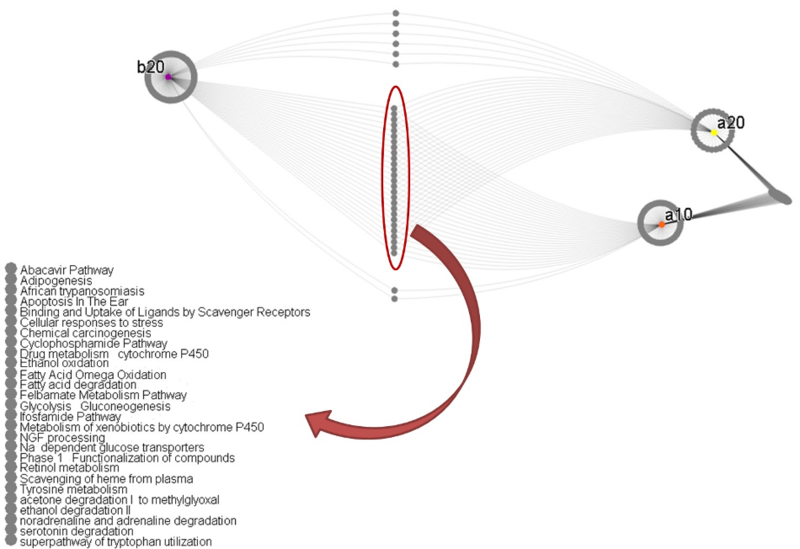 We searched for any known connections (interactions) in The Integrated Interactions Database (IID), a database of known and predicted protein-protein interactions created by our lab . 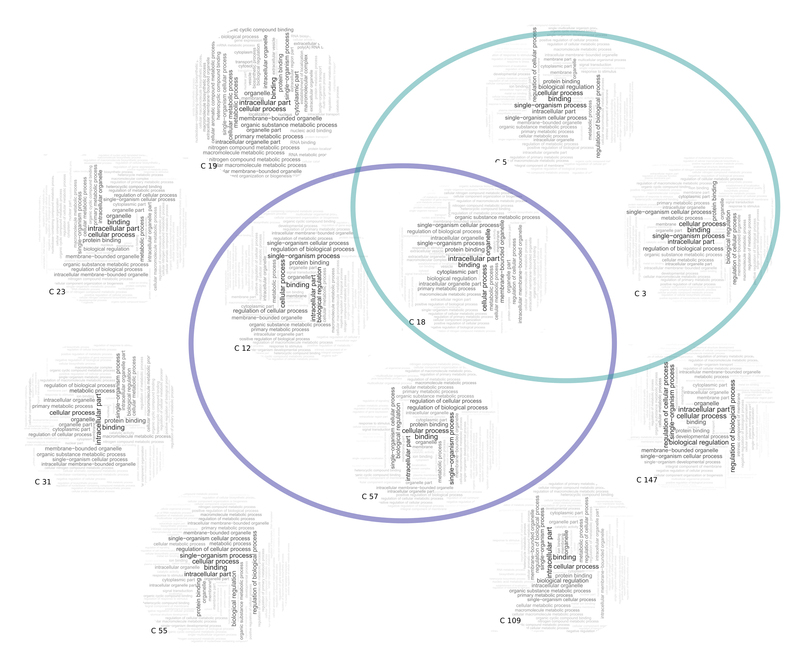 We found several interactions in IID that mirror these cancer interactions, but the overlap was not statistically significant. Figure 2. 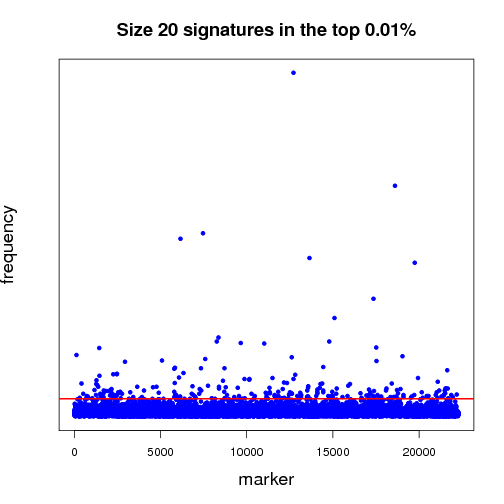 Biomarker frequencies in size_10 vs. size_20 signatures. Points to the left of the diagonal line represent biomarkers occurring more frequently in size_20 signatures. 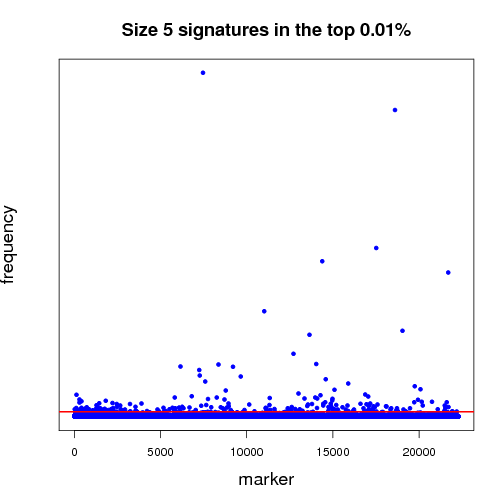 Note the overall correlation in ranks between sizes, but greater variation in frequencies for shorter signatures. We also took the genes selected for the second and third stages, and searched for them in a database of biological pathways. See Figure 3. We discovered our lists of genes were enriched (present in statistically significant numbers; p ≤ 0.01) in several pathways. See Table 1. Although our analysis is ongoing, we can see that two of the identified pathways are components of Mevalonate metabolism. Mevalonate pathways are already targets for many drugs such as statins and have been implicated as targets for treatment in lung cancer [2, 3]. 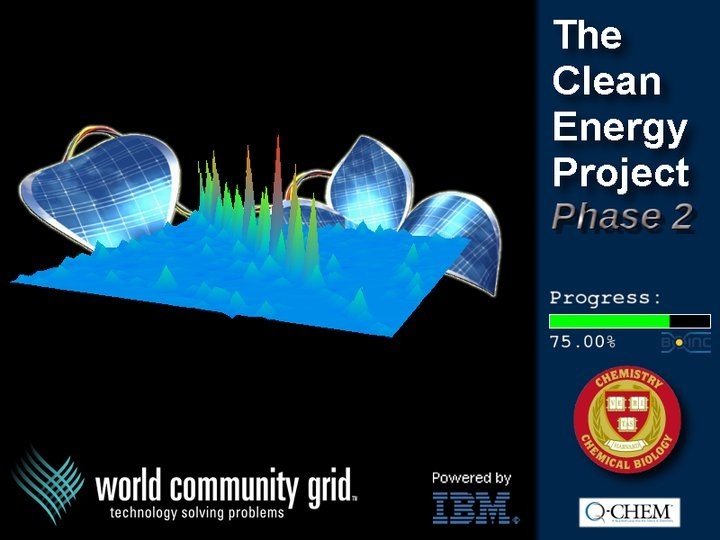 Some of the downstream analysis will focus on how the signatures discovered by World Community Grid processing will ultimately connect to pathways and other research. We have used Mevalonate as an example, but there are many more that can be examined to assess the viability of our best signatures. Table 1. List of biological pathways enriched with MCM’s “discovered-pair” genes. P-values < 0.01 indicate statistical significance. Figure 3. Biological pathways enriched by biomarker targets in the second (sizes 10 and 20) and third (all sizes) stages. Some pathways are common to all three. 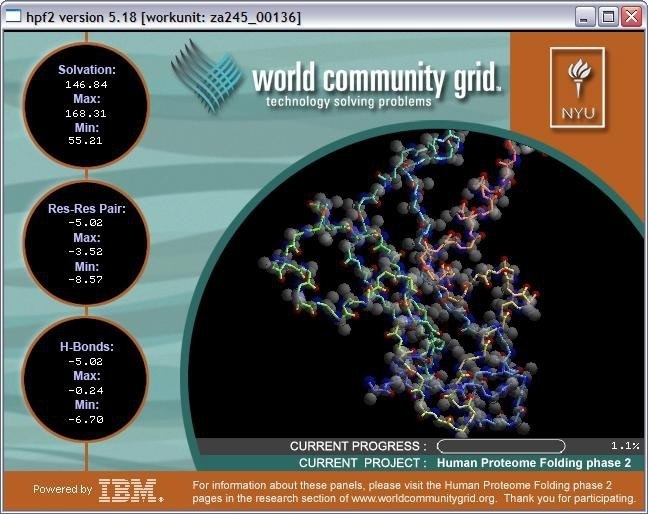 The third stage is nearly complete, and will be the final piece of MCM lung cancer analysis on World Community Grid before we switch to ovarian cancer. Ovarian cancer is a gynecologic malignancy that ranks 8th for incidence and 5th for death rate among all women’s cancers. The American National Cancer Institute’s Surveillance, Epidemiology, and End Results (SEER) program estimated 22,240 new cases and 14,030 deaths from ovarian cancer in 2013. Patients are usually diagnosed at an advanced stage (61% present metastasized cancer) and have poor prognosis (27.3 months for metastasized stage (SEER)). Ovarian cancer was chosen as our next dataset because of long experience with this disease in our own lab, and in those of collaborators. We look forward to using MCM to glean new insights into ovarian cancer. We expect the transition to ovarian cancer research to begin in early 2016, and do not anticipate any interruption in the flow of work units. 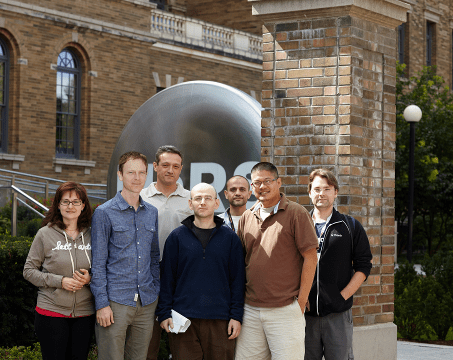 We wish to thank World Community Grid members for their continued support and interest for this and other projects. Without you, this work would not be possible. 2. Hwa Young Lee, In Kyoung Kim, Hye In Lee, Hye Sun Kang, Chan Kwon Park, Jick Hwan Ha, Seung Joon Kim, Sang Haak Lee. Mevalonate pathway inhibitors as chemopreventive agents on lung cancer cell lines: p53 might be a potent regulator. [abstract]. In: Proceedings of the Eleventh Annual AACR International Conference on Frontiers in Cancer Prevention Research; 2012 Oct 16-19; Anaheim, CA. Philadelphia (PA): AACR; Cancer Prev Res 2012;5(11 Suppl):Abstract nr A48. 3. Yano K. Lipid metabolic pathways as lung cancer therapeutic targets: a computational study. Int J Mol Med. 2012 Apr;29(4):519-29. doi: 10.3892/ijmm.2011.876. Epub 2011 Dec 30. Navab R, Strumpf D, To C, Pasko E, Kim KS, Park CJ, Hai J, Liu J, Jonkman J, Barczyk M, Bandarchi B, Wang YH, Venkat K, Ibrahimov E, Pham NA, Ng C, Radulovich N, Zhu CQ, Pintilie M, Wang D, Lu A, Jurisica I, Walker GC, Gullberg D, Tsao MS. Integrin a11b1 regulates cancer stromal stiffness and promotes tumorigenecity in non-small cell lung cancer, Oncogene, 2015. In press. Agostini M, Zangrando A, Pastrello C, D’Angelo E, Romano G, Giovannoni R, Giordan M, Maretto I, Bedin C, Zanon C, Digito M, Esposito G, Mescoli C, Lavitrano M, Rizzolio F, Jurisica I, Giordano A, Pucciarelli S, Nitti D. A functional biological network centered on XRCC3: a new possible marker of chemoradiotherapy resistance in rectal cancer patients, Cancer Biol Ther, 16(8):1160-71, 2015. Agostini M, Janssen KP, Kim LJ, D’Angelo E, Pizzini S, Zangrando A, Zanon C, Pastrello C, Maretto I, Digito M, Bedin C, Jurisica I, Rizzolio F, Giordano A, Bortoluzzi S, Nitti D, Pucciarelli S. An integrative approach for the identification of prognostic and predictive biomarkers in rectal cancer. Oncotarget. 2015. Sep 2. Stewart, E.L., Mascaux, C., Pham, N-A, Sakashita, S., Sykes, J., Kim, L., Yanagawa, N., Allo, G., Ishizawa, K., Wang, D., Zhu, C.Q., Li, M., Ng, C., Liu, N., Pintilie, M., Martin, P., John, T., Jurisica, I., Leighl, N.B., Neel, B.G., Waddell, T.K., Shepherd, F.A., Liu, G., Tsao, M-S. Clinical Utility of Patient Derived Xenografts to Determine Biomarkers of Prognosis and Map Resistance Pathways in EGFR-Mutant Lung Adenocarcinoma, J Clin Oncol, 33(22):2472-80, 2015. 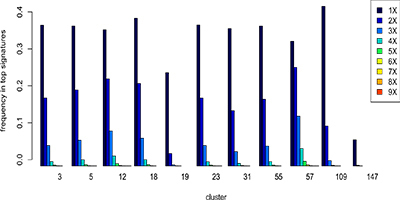 Fortney, K., Griesman, G., Kotlyar, M., Pastrello, C., Angeli, M., Tsao, M.S., Jurisica, I. Prioritizing therapeutics for lung cancer: An integrative meta-analysis of cancer gene signatures and chemogenomic data, PLoS Comp Biol, 11(3): e1004068, 2015. 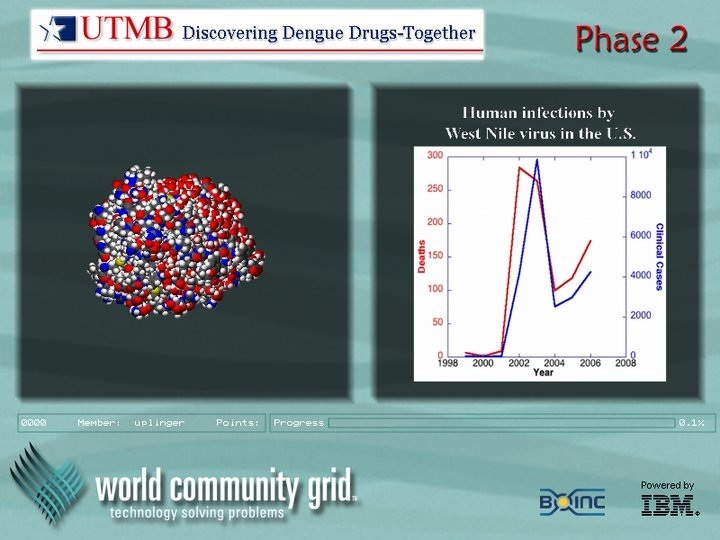 Some of this work was presented at multiple meetings and institutions: including keynotes at The 14th International Conference on Machine Learning and Applications and The American Society for Blood and Marrow Transplantation, Corporate Council Meeting; and invited highlight talks at Intelligent Systems for Molecular Biology Conference and Basel Computational Biology Conference. Also, for the second year in a row, Dr. Jurisica has been included in Thomson Reuters highly cited researcher list; Out of 108 in computer science and 3,125 world-wide in 21 fields of science. Results from the first stage of the Mapping Cancer Markers project are helping the researchers identify the markers for lung cancer, as well as improve their research methodology as they move on to analyze other cancers. Once again, the Mapping Cancer Markers (MCM) team would like to extend a huge thank you to the World Community Grid members. Although we publish this thank you each update, we are truly grateful for your contribution to this project. The MCM project has continued to process lung cancer data, exploring fixed-length random gene signatures. This long stage of the project is nearly over, and we are preparing to transition our focus to a narrower set of genes of interest. 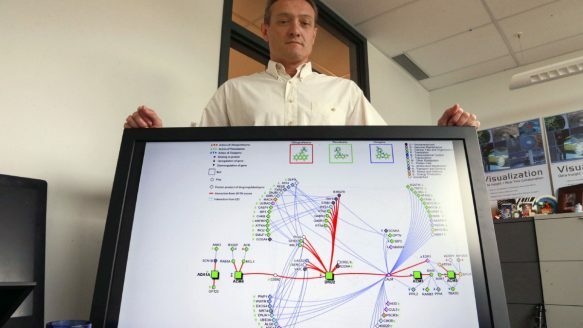 Target genes will be chosen by a process combining statistics from the initial results, with pathway and biological-network analysis. In our previous update, we reported the adoption of a new package, the IBM® InfoSphere® Streams real-time analytics platform, to process our World Community Grid data. The majority of our work since the last update has concentrated on continued development and expansion of our Streams system in order to handle the incoming data more robustly and efficiently. There are two main reasons why stream-processing design is better for processing MCM results than a batch-computing approach. 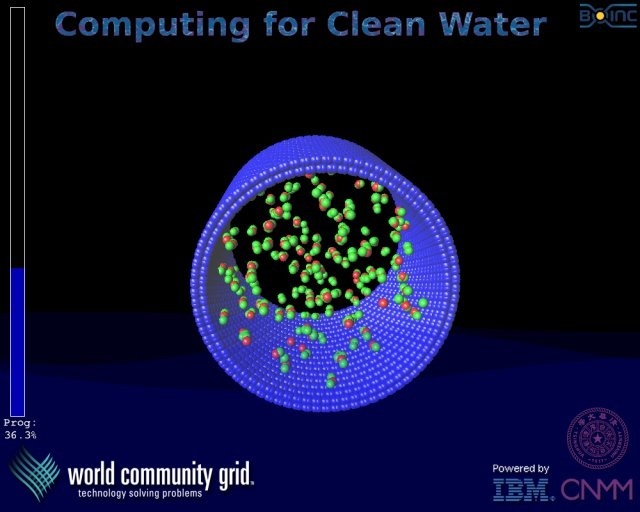 One reason relates to the nature of World Community Grid: a huge computing resource that continuously consumes work units and produces compute results. Data is best processed as it arrives, to avoid backlogs or storage limitations. Importantly, as we transition to the new focus, this enables us to make the process of designing new work units based on partial results more effective. 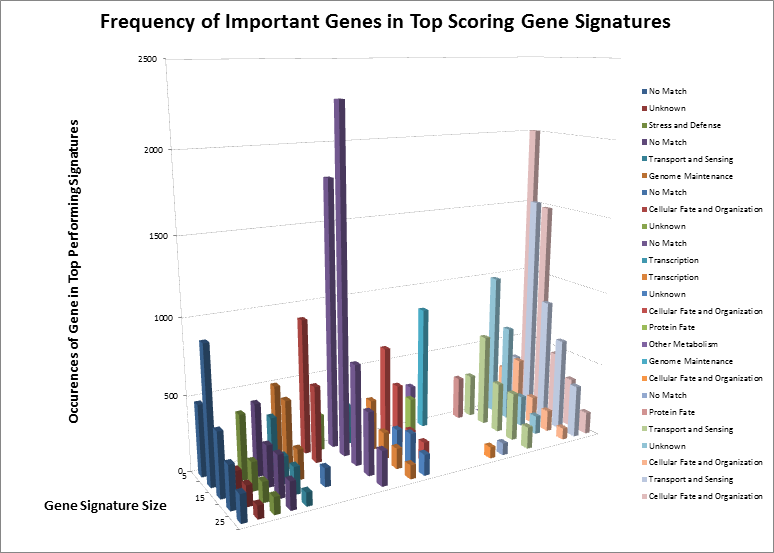 MCM will soon focus on genes of interest revealed by our broad survey of gene-signature space in the first stage. To narrow the focus, we will take an iterative approach, where we design small batches of work units (e.g., 100,000 units), submit them to World Community Grid, analyze the results, and then incorporate the new analysis into designing the next batch. In this way, we will slowly converge towards the answers we are seeking. Because of the continuous nature of the MCM project, and the volume of data we receive on a daily basis, it is imperative that our analysis system processes results quickly enough to generate the next set of work units. The MCM project has continued to process lung cancer data, exploring random fixed-length signatures of between 5 and 25 biomarkers. This computational component of the “landscape” stage is winding down, and we are preparing to transition our focus to a narrower set of genes of interest. 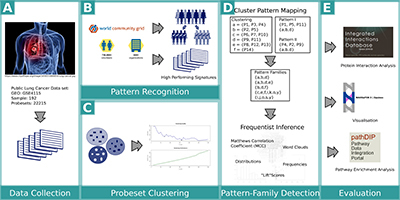 Target genes will be selected by integrating results from several methods, carefully combining statistics from the initial results with pathway and biological-network analysis. 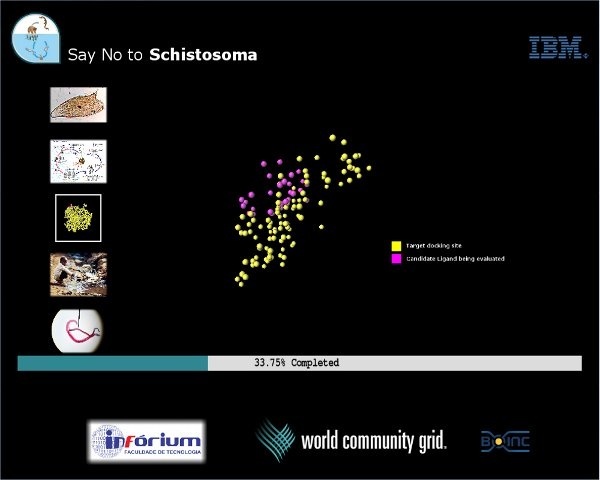 One of the most exciting (and crucial) parts of this project is the integration of other research to help understand the results we are collecting. We already know that in most cancers no single biomarker is sufficient, we can find thousands of clinically-relevant signatures, and, most importantly, many seemingly weak markers when combined with others provide highly useful information. Therefore, we have been trying to find these “best supporting actors” and then the best signatures through “integrative network analysis”.
) are used to design new MCM work units targeting areas of interest in signature space. We know that disease is more accurately described in terms of altered signaling cascades (pathways): higher-level patterns composed of multiple genes in a biological network. A pathway can be defined as a series of reactions (“steps”) that result in a certain biochemical process. For example, one could consider the electrical and mechanical systems in a car as a set of interrelated pathways. These systems are important for the overall function of the car; however, some are clearly more important than others. In the same way, a particular cancer occurrence could have a single catastrophic cause (a missing engine block) or smaller, multiple causes affecting the same system (e.g., the bolts holding the exhaust system together). Around the world, researchers are continually finding, publishing and curating biological pathways and their building blocks (protein interactions). We are taking this information and applying it to high-scoring genes and gene signatures identified from Mapping Cancer Marker results. 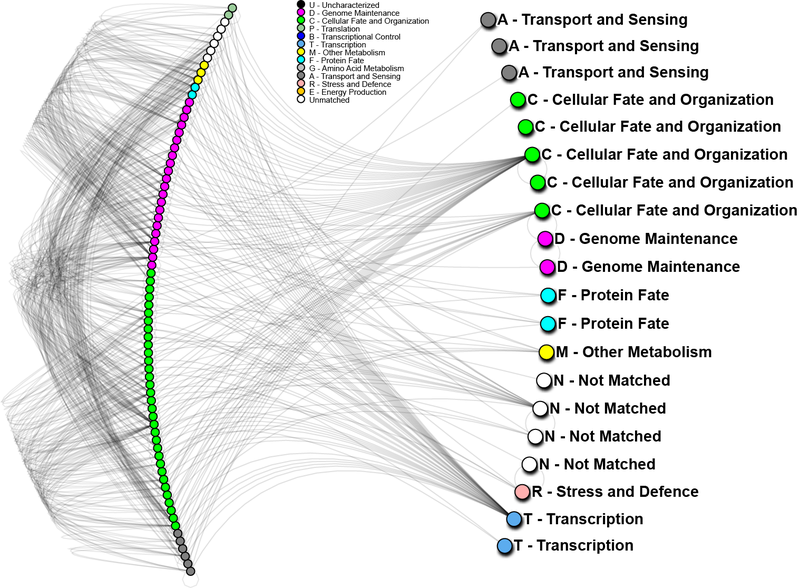 For example, if the first part of our landscape study identified a certain gene as a potential target, we can see via our network analysis (NAViGaTOR) as well as other external sources if that same gene is involved in known pathways. We can then gather information about those pathways and refine our findings by resubmitting work units to World Community Grid. In essence, we are identifying genes of interest by combining top-scoring genes with pathway and network context. Those investigations will continue to refine our search space and converge on better and better solutions. Below, we list some examples of this work, but especially Kotlyar et al., Nature Methods, 2015 work provides comprehensive in silico prediction of these signaling cascades. Wong et al., Proteomics, 2015 introduces systematic approach to derive important information about cancer-related structures in these networks. Fortney et al., PLoS Computational Biology uses results of this work to identify potential new treatment options for lung cancer. We expect a gradual and seamless transition to the new stage of MCM, with no interruption in the supply of work units, and no changes to the visualization or code. 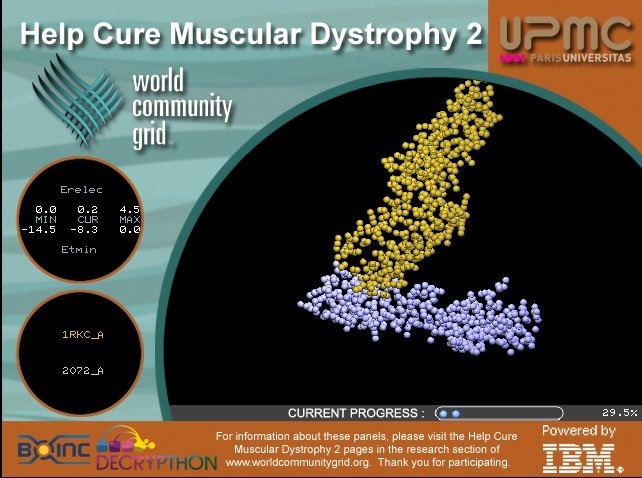 Both stages will overlap for a period as the last statistics from the first stage are gathered, and the initial, targeted work units are sent out. Average work unit run-time should remain the same. The consistency of run-times should remain the same or improve. Hoeng J, Peitsch MC, Meyer, P. and Jurisica, I. Where are we at regarding Species Translation? 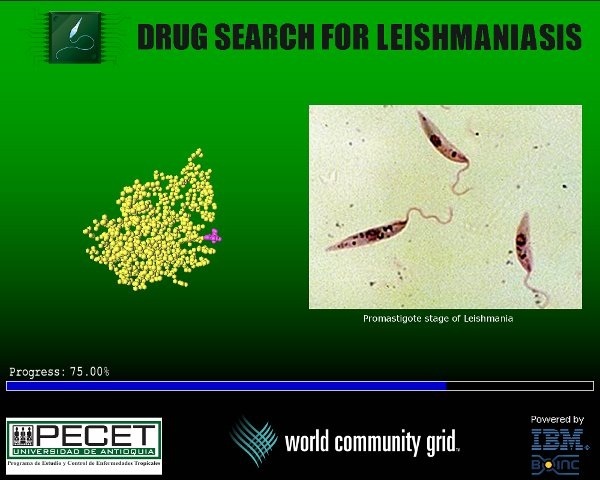 A review of the sbv IMPROVER Challenge, Bioinformatics, 2015. In press. Fortney, K., Griesman, G., Kotlyar, M., Pastrello, C., Angeli, M., Tsao, M.S., Jurisica, I. Prioritizing therapeutics for lung cancer: An integrative meta-analysis of cancer gene signatures and chemogenomic data, PLoS Comp Biol, 2015, In Press. Kotlyar M., Pastrello C., Pivetta, F., Lo Sardo A., Cumbaa, C., Li, H., Naranian, T., Niu Y., Ding Z., Vafaee F., Broackes-Carter F., Petschnigg, J., Mills, G.B., Jurisicova, A., Stagljar, I., Maestro, R., & Jurisica, I. In silico prediction of physical protein interactions and characterization of interactome orphans, Nat Methods, 12(1):79-84, 2015. Lalonde, E., Ishkanian, A. S., Sykes, J., Fraser, M., Ross-Adam, H., Erho, N., Dunning, M., Lamb, A.D., Moon, N.C., Zafarana, G., Warren, A.Y., Meng, A., Thoms, J., Grzadkowski, M.R., Berlin, A., Halim, S., Have, C.L., Ramnarine, V.R., Yao, C.Q., Malloff, C.A., Lam, L. L., Xie, H., Harding, N.J., Mak, D.Y.F., Chu1, K. C., Chong, L.C., Sendorek, D.H., P’ng, C., Collins, C.C., Squire, J.A., Jurisica, I., Cooper, C., Eeles, R., Pintilie, M., Pra, A.D., Davicioni, E., Lam, W. L., Milosevic, M., Neal, D.E., van der Kwast, T., Boutros, P.C., Bristow, R.G., Tumour genomic and microenvironmental heterogeneity for integrated prediction of 5-year biochemical recurrence of prostate cancer: a retrospective cohort study. Lancet Oncology. 15(13):1521-32, 2014. Berlin, A., Lalonde, E., Sykes, J., Zafarana, G., Chu, K.C., Ramnarine, V.R., Ishkanian, A., Sendorek, D.H.S., Pasic, I., Lam, W.L., Jurisica, I., van der Kwast, T., Milosevic, M., Boutros, P.C., Bristow, R.G.. NBN Gain Is Predictive for Adverse Outcome Following Image-Guided Radiotherapy for Localized Prostate Cancer, Oncotarget, 3:e133, 2014. Lapin, V., Shirdel, E., Wei, X., Mason, J., Jurisica, I., Mak, T.W., Kinome-wide screening of HER2+ breast cancer cells for molecules that mediate cell proliferation or sensitize cells to trastuzumab therapy, Oncogenesis, 3, e133; doi:10.1038/oncsis.2014.45, 2014. Tu WB, Helander S, Pilstål R, Hickman KA, Lourenco C, Jurisica I, Raught B, Wallner B, Sunnerhagen M, Penn LZ. Myc and its interactors take shape. Biochim Biophys Acta. pii: S1874-9399(14)00154-0.